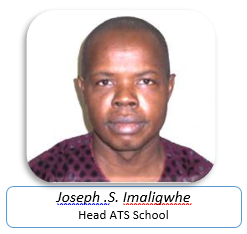 Mr. Joseph S. lmaligwhe is a Chief ATS Instructor with many years of experience, started his professional training in the field as a cadet trainee. Later, the Aerodrome and Approach diploma in NCAT and subsequently licenst<! in the field. Other license trainings like; Areal Airways, Radar, Area Rada1j ICAO English Proficiency, Aviation Security, TIC I and 2, TDC, ISDU etc. are among some of his areas of vast expertise. A TS/COM School was establish in 1964 to provide the manpower required to manage the Nigerian Airspace in the fast growing Aviation Industry. To train and prepare personnel capable of professionally providing the best Air Traffic Services to keep the Airspace safe, orderly in Nigeria and the world at large. To professionally equip Air Traffic Service providers with the most recent training ensuring good foundation in the skill, knowledge and attitude required in their respective careers.